Shape the clay into a beak, comb and feet. Rub a dab of white glue onto the clay parts and press them into place on the egg (otherwise, the clay shrinks and detaches as it dries). 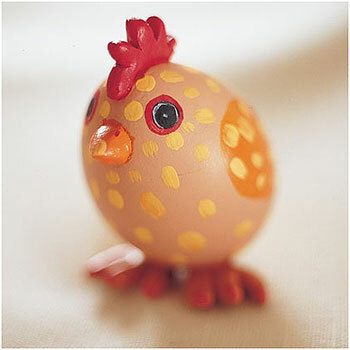 Hold for 1 minute until the glue starts to dry, then set the egg with attached clay aside to dry completely. Finish the chick by painting on eyes, wings and feathers.